​The Triple Spine Lakeland Challenge is the brainchild of a walking friend of mine and is designed to be a tough three-day Lake District odyssey that will test the physical and mental strength of any fell walker. 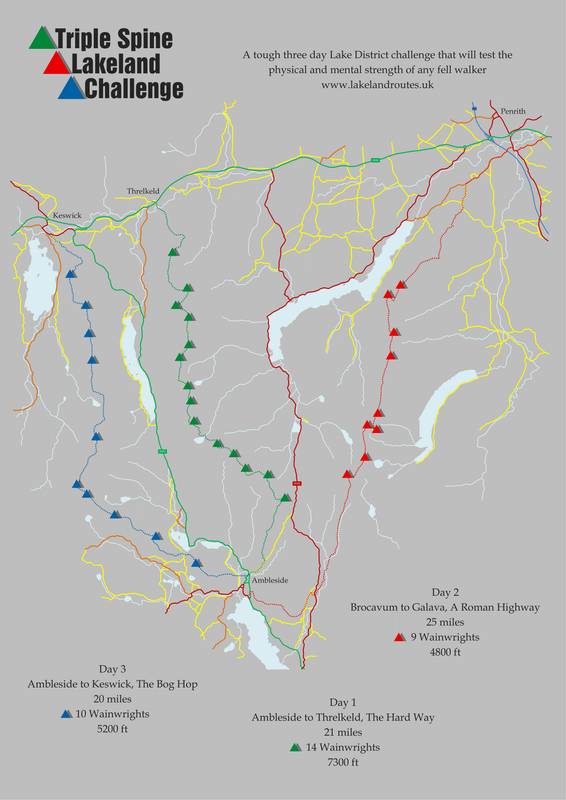 The route encompasses three spines of Wainwright Fells - two of which spread themselves out from Ambleside with the remaining spine linking up the Roman Forts at Brocavum (near Penrith) and Galava (Ambleside). The distances to walk and the ascent to climb make this a tough 3 days. Add in to this the threat of the unpredictable Cumbrian weather and the early starts then it becomes a big test of resolve, fitness and will push your ability to its limits. Totalling 66 miles or so with over 17000 feet of ascent it is not for the faint hearted but given fair weather and favourable walking conditions then it is a fantastic opportunity to enjoy 3 delightful days walking over routes designed to test you, particularly the final day which is known affectionately as "The Bog Hop". ​It is worth stressing that walkers are recommended to carry the requisite kit, water, food plus the relevant navigational aids - as a minimum a map and compass and more importantly must know how to use them. Read on to see how I fared on this Lakeland Classic - click on the link below and I hope you enjoy following the walk.